Take a glassful of red-currant juice, and a half glass of gooseberry syrup. In another vessel bruise a glassful of fresh raspberries, upon which pour successively a glass of Brandy, 2 glasses of Gin, then the currant juice and gooseberry syrup, and let stand for half an hour. Then add a glass of White Wine, the ice, and shake. Serve, placing in the glasses either a raspberry or a small sprig of red-currants. A very pleasant and refreshing summer cocktail. Right, talk about absurd. Well, the next time I see Red Currants at the supermarket, I shall be sure and buy them so I can rush home, juice them, and use them as a garnish for an authentic version of this cocktail. Unfortunately, I almost never see them. So, I shall be substituting a combination of Black Currant drink and Pom Wonderful Pomegranate juice for Red Currant juice. I am also fresh out of Gooseberry Syrup, so shall use some Gooseberry Jam I found at Roxie Market, instead. Combine Black Currant Ribena, Pomegranate juice, and Gooseberry Preserves. Add a 2 oz measure of fresh raspberries into another container and muddle, upon which pour successively a 2 oz of Brandy, 4 oz of Gin, then the currant juice and gooseberry syrup, and let stand for half an hour on ice. Add ice and shake briefly and pour into coupes. Top with sparkling Wine. 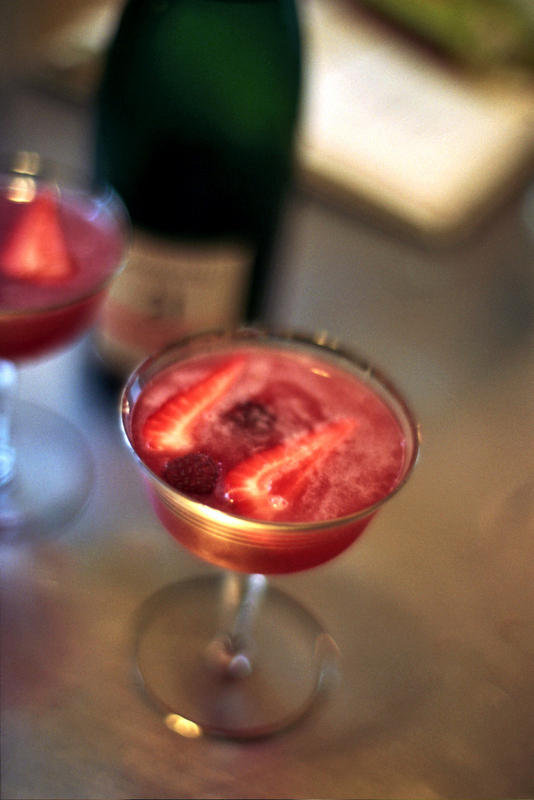 Serve, placing in the glasses with a couple raspberries and a cut strawberry. I split this between two glasses, one for me and one for my wife. We were both surprised how dry the cocktail was. With its pinkness and fruity garnishes, we were expecting it to be a lot sweeter and more girly than it is. I generally hate muddled cocktails, just because of the mess they make in the sink and your shaker, but this was one for which I could see making an exception. Very different from a the modern take on this type of drink and quite enjoyable. Between the time I made this cocktail, and the publication of this post, I received word from David Wondrich of a new source for Savoy Cocktails. It appears most of the “party” cocktails, those marked for “6 People” came from a 1925 book by Nina Toye and A.H. Adair called, “Drinks Long & Short”. While David identified the source, Greg Boehm, of Cocktail Kingdom, was kind enough to scan the cocktail recipes section of the book so I could collate and check for Savoy inaccuracies. It’s good to have friends with deep libraries. Scanning through, I discovered the “Virgin Special Cocktail” was in the book under another name. Midsummer Cocktail: A very pretty and refreshing summer cocktail. One glass of the juice of fresh red currants, half a glass of Sirop-de-Groseille. Mash a cupful of fresh raspberries and pour over them a glass of brandy and two glasses of gin, add the currant juice and the Sirop and let stand half an hour. Add a glass of sweet white wine, ice, and shake. Serve with a raspberry or small bunch of currants in each glass. Well, that’s pretty close to the Savoy Cocktail Book recipe. The only big difference being a common misunderstanding about “Sirop-de-Groseille”. While it seems like Groseille should be Gooseberry Syrup, it is, in fact, Red Currant Syrup. Well, Gooseberries and Currants are very closely related. As for a substitution, if I had known the recipe called for Red Currant Syrup, I probably would have used a combination of Pomegranate Juice and Red Currant Jelly, and skipped the Black Currant Kool Aid.